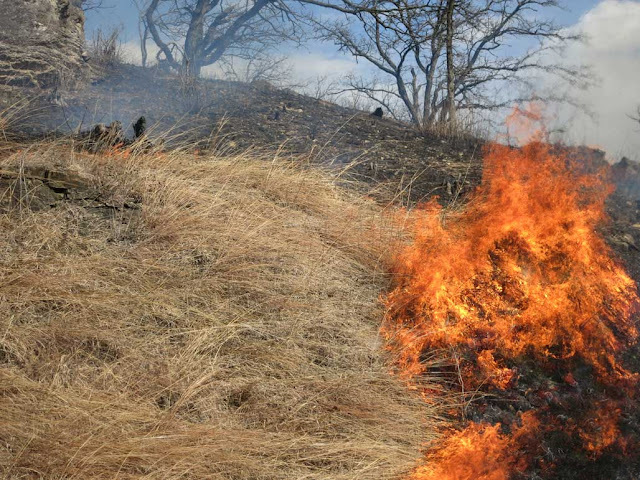 Savanna burns can present problems when special trees are present within lush prairie grass. Flame heights may often be high, and may seriously damage even upper tree branches. 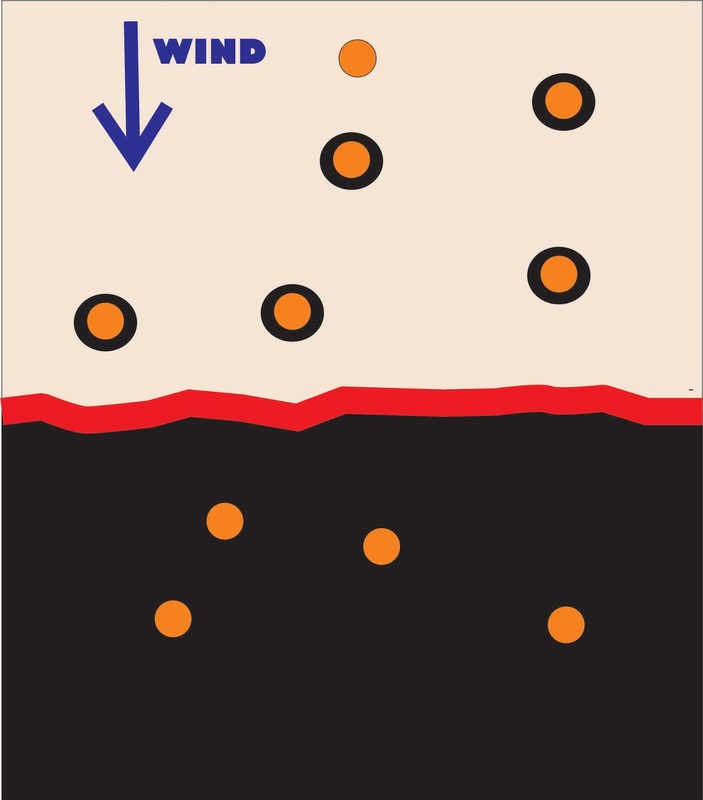 Under such conditions, the technique of tree-centered spot firing can be used. 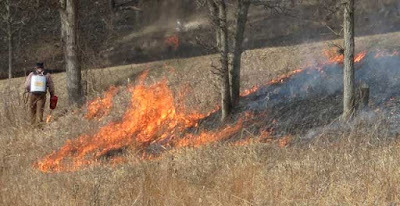 With tree-centered spot firing, the bases of trees to be protected are lighted by a crew member moving ahead of the flaming front. A few drops of fire is all it takes to blacken the base of the tree. When the flaming front reaches that tree the flames drop and the tree is unharmed. Our burn crew has been using this technique for the past several years. It takes an additional crew member but perhaps saves mop-up time at the end of the burn. Also, once the trees are protected, this crew member can proceed to interior lighting, which is almost always necessary on a savanna burn. One might ask whether this precaution is necessary for bur oaks, which are generally quite fire resistant. We use this mainly for smaller specimens, which are less fire tolerant, as a precautionary measure. C. Philip Weatherspoon, George A. Almond, and Carl N. Skinner. 1989. “Tree-centered spot firing---a technique for prescribed burning beneath standing trees.” Western Journal of Applied Forestry, Vol. 4: 29-31. We keep pushing the burn season further back toward winter! 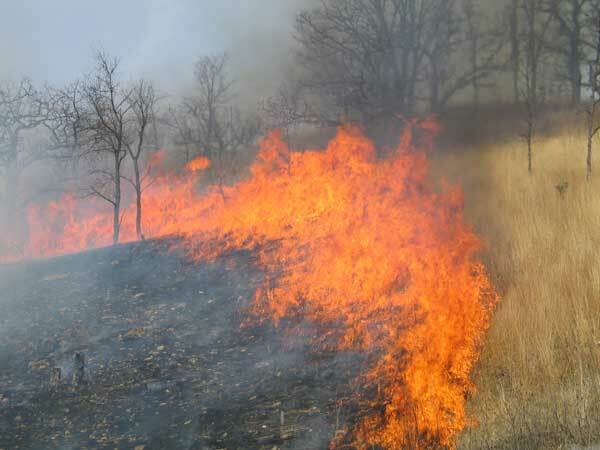 Ten years ago we generally did our first burn in early April. 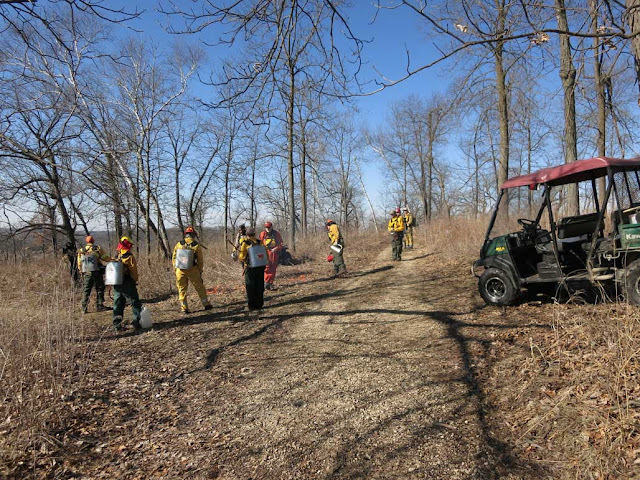 In 2015 we did the first burn on March 18. Last year it was March 11. And now this year, February 22. 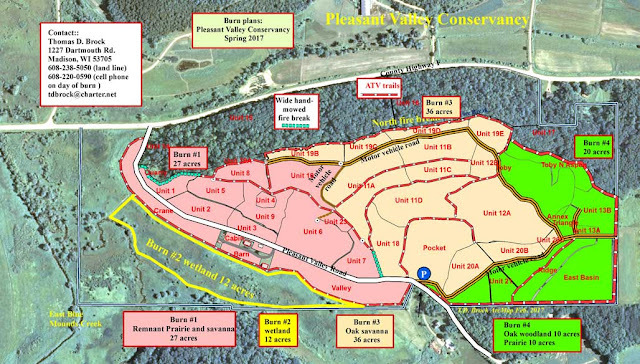 Our 2017 burn plans are shown at the end of this post. Burn #1 was what we did today. We had a crew of 13 and all equipment was ready to go. Despite the dew on the grass at daybreak, by 10:30 AM, with a full sun and humidity below 50%, conditions were great and we started lighting. The main burn (see map) included two ridge-top savannas and the large prairie/savanna remnant on the south-facing slope (27 acres). The latter burn is interesting because once the blacklines are in, it mostly takes care of itself. This burn was finished at 12:30 PM. After lunch, we burned the long strip of planted prairies south of Pleasant Valley Road. Because of the complicated edges and various structures to protect, the afternoon burn took longer than the morning, although we were finished with everything by 4:00 PM. 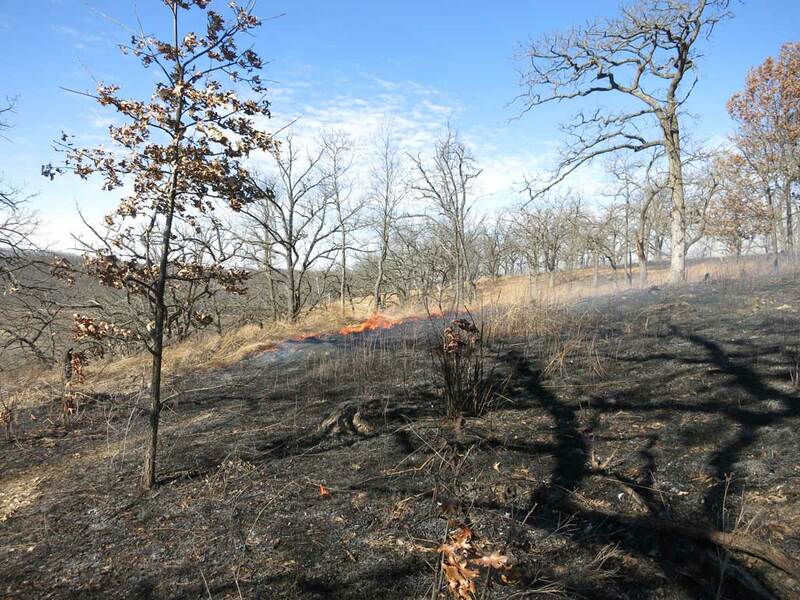 Starting the ridge-top savanna burn. Most of the burn was either a backing or flanking burn. Because of the lush fuel, the fire carried well. 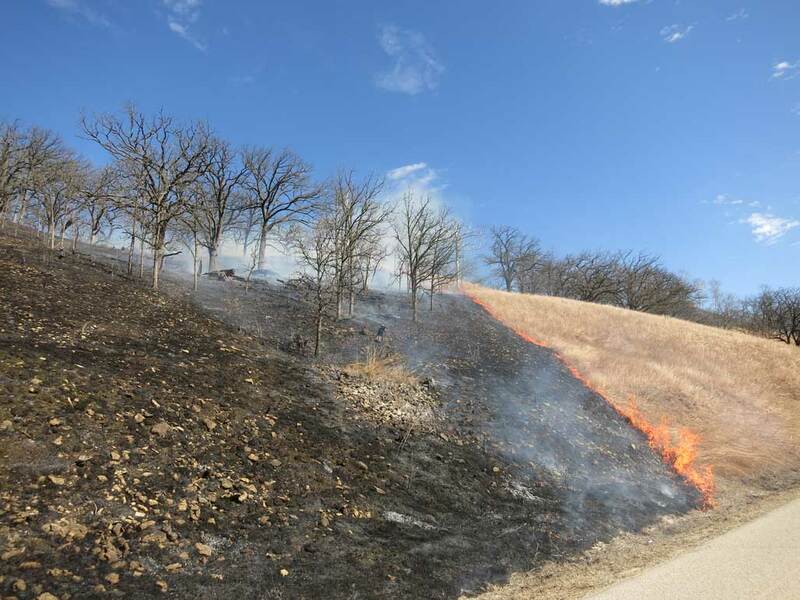 Flanking fire across the south slope. The principal fuel here was warm-season grasses, Indian grass and little bluestem. Note how rocky the south slope is. 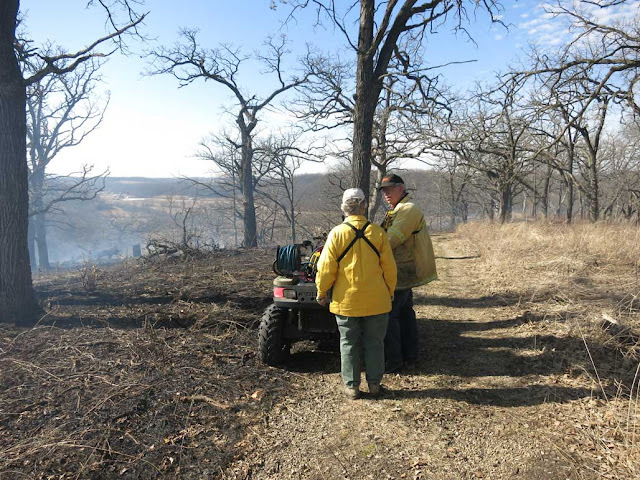 Kathie and Denny monitoring the savanna burn. The savanna on the right will be part of Burn #2, to be done sometime in March. The burn is almost complete. Within seconds this fuel was gone and the fire was out. Only a few "smokers" were evident, mainly downed dead logs. Since they were well inside the burn unit, they were allowed to burn. Scientific research is a glorious occupation, and probably no category is more fascinating than field work in a National Park such as Yellowstone National Park. It was my good fortune to have been able to carry out research in the Park with a dedicated group of students and research associates for over 10 years and to remain associated with the Park for much longer. Although what we did was basic research, a major practical application came from it, due to the discovery by Hudson Freeze and myself of the bacterium Thermus aquaticus. This became the source of the enzyme Taq polymerase, which made the Polymerase Chain Reaction (PCR) practical, thus revolutionizing research on DNA. The research discussed here depended greatly on financial support from two federal agencies, the National Science Foundation, and the U.S. Atomic Energy Commission (now subsumed under the Department of Energy). It also depended greatly on support in numerous ways from the two universities where I was employed, Indiana University-Bloomington, and University of Wisconsin-Madison. 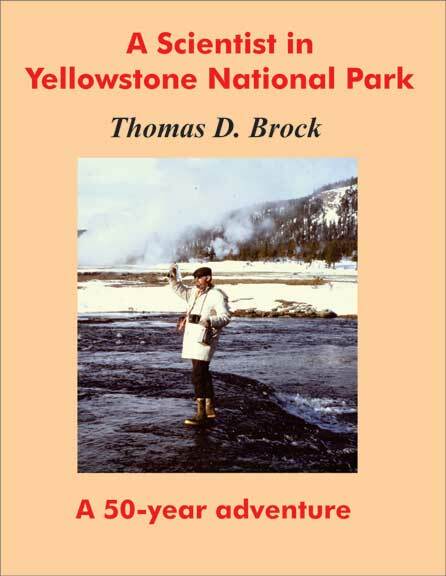 Finally, since its inception Yellowstone National Park has recognized and encouraged scientific research in the Park, and without the Park’s permission, none of this work could have been carried out. It is a truism in science that basic research is the foundation from which applications arise. My Yellowstone research is one of the best examples of this truism, and has been so recognized in many news media and publications. Although this book might be called a “memoir”, I emphasize that it is not based on memory, but on documents that were created at the time. It is thus closer to “real” history of science than to a memoir. In the same way, the numerous photographs reproduced here were taken at the time of the events.